The MacDonalds of Keppoch and Garragach were also known as the Clan Ranald of Lochaber, and descend from Alastair Carrach, third son of John, first Lord of the Isles. He acquired his lands through the marriage settlement of John and his second father-in-law, Robert II when his estates were agreed to be apportioned between the children of both his marriages. Alastair fought alongside Donald of the Isles at the Battle of Harlaw in 1411, supporting his claim to the Earldom of Ross. For his part in 1413 in the insurrection led by Donald Balloch on behalf of the 3rd Lord of the Isles, he was forfeited and some of his lands in Lochaber were bestowed upon Duncan Mackintosh consequently leading to a long feud between the two clans. In 1493 on the final forfeitude of the Lord of the Isles the MacDonalds maintained their position in Lochaber. Donald, 3rd chief was killed in battle with Dougal Stewart, 1st of Appin. John, 4th of Keppoch was deposed by the clan for delivering up one of the clansmen to the Mackintosh chief of Clan Chattan. His cousin, Donald Glas was elected chief and his son Ranald, chief after him was beheaded at Elgin in 1547 by the Earl of Huntly for his part in the rebellions at that time. His descendant, Ranald, 9th also spent most of his life as an outlaw. Alastair, 12th chief was murdered in 1663 and is commemorated at Tobair-nan-ceann, the "Well of the Heads" near Invergarry where the heads of the seven murderers were washed before being placed before Lord MacDonnell of Invergarry. A statue was later placed at the spot by Col Alastair MacDonnell of Glengarry in the 19th century. Coll, 15th held off the government and the Mackintoshes for over 40 years by sword in Lochaber and his son Alexander, 16th, despite at being old by 1745 was one of the first to join Prince Charles. He died Culloden but the last chief of the MacDonnells of Keppoch in the direct line did not die till 1889. Glengarry. Clan lands of the MacDonnels of Glengarry. One of the many branches of the MacDonalds. A lot of people from this area emigrated to Canada. BADGE: Fraoch gorm (Sea vulgaris) common heath. PIBROCH: Failte Mhic Alastair, Cille chriosd, and Blar Sron. IT is not many years since there lived in an old house with high-walled garden in the heart of Rothesay, two old maiden ladies whose pride and regret were that they were the last in this country of the great old house of the MacDonells of Glengarry. They were women of noble appearance and strong character, and one of them at least took a considerable part in public affairs. Many stories regarding them were told in the town. Among these one may be cited as characteristic. When the late Marquess of Bute, as a young man, called upon them on the eve of his marriage to a daughter of the great Roman Catholic house of Howard, it had become known that he was likely himself to become a member of the Church of Rome. Of this proceeding the Misses MacDonell did not approve, and they took the opportunity to inform him that if he did enter the Roman Communion they would "no longer be able to call at Mount Stuart." Among the treasures which the survivor of them took delight in preserving was a tall Shepherd�s crook of hazel which had been sent home to her by her nephew, the young Chief of the Clan in Canada. That hazel staff represented the tragedy of the race, for after the death in 1828 of the seventeenth Chief of Glengarry, who is said to have been the model in part of Pergus Macivor in Sir Walter Scott�s Waverley, his impoverished successor, gathering together between 500 and 600 of his clansmen, emigrated with them in a body to Canada, where they still perpetuate the traditions of the race which had its headquarters on the lovely shores of Loch Oich in the Great Glen. On the shore of Loch Oich still stand the ruins of the noble and picturesque ancient stronghold of Invergarry, which was the seat of the chief. Among the many memories of its days of magnificence and hospitality, the last is not the least striking. It was the day of his defeat at Culloden, and Prince Charles Edward was in full flight before the "Red Soldiers" of the Butcher Duke of Cumberland. Hungry and almost alone he reached Invergarry, and was there entertained to a meal which consisted of a brace of salmon which had been taken from the loch by the forester only an hour or two before. That was the last hospitality which the noble old house of Invergarry was to afford, for a few days afterwards the "Red Soldiers" came ravaging down the loch, making the country of the clans a desert with fire and sword, and by order of the Duke of Cumberland, Invergarry Castle was burned to the ground. Of the noble old race which had its home here the history is romantic in the extreme. Like the other two great branches of the clan, the MacDonalds of the Isles and of Clanranald, which contest with Glengarry the supreme chiefship of the name, the MacDonells are directly descended from Reginald, the younger son of the famous Somerled, King of the Isles in the twelfth century. Their patronymic of MacDonald they took from Donald, the elder of Reginald�s two sons. A common ancestor of all three houses was Donald�s grandson, Angus Og, who supported King Robert the Bruce in the Wars of Succession, entertained him in his castle of Dunavertie, at the south end of Kintyre, when he was fleeing for safety to the Island of Rachryn, and on whom in consequence Bruce�s grandson, King Robert II., bestowed the territories of Morvern, Ardnamurchan, and Lochaber, forfeited by the Macdougals, descendants of Somerled�s elder son, who had sided with Baliol and Comyn against the House of Bruce. A privilege claimed by all the MacDonalds in common was the right to the post of honour on the right in all Scottish armies on the day of battle. This right, it is said, was conferred upon them by King Robert the Bruce in recognition of the part they played on the field of Bannockburn, and the ignoring of it, they declare, brought about the disastrous issues of the battles of Harlaw and Culloden. On other occasions, as at Prestonpans and Falkirk, when accorded their proper position on the right of the Scottish armies, they performed prodigies of valour. Angus Og�s son, John, first Lord of the Isles, had by his first marriage three sons, John, Godfrey, and Ranald; and it is from the third of these, who inherited Moidart and Glengarry, that the families of Glengarry and Clanranald are descended. John of the Isles, however, repudiated his first wife, married the Princess Margaret, a daughter of King Robert II., and settled the Lordship of the Isles upon his family by her. From her second son John are descended the MacDonells, Earls of Antrim, and from her third son Alexander, the MacDonalds of Keppoch. Of her eldest son, Donald of the Isles, who fought the battle of Harlaw, the legitimate line seems to have come to an end with John, fourth and last Lord of the Isles, who died a beggar in Dundee or a monk at Paisley Abbey in 1498; and the later heads of the house of the Isles are descended from John�s half brother, Hugh MacDonald of Sleat. [In the peerages, Celestine and Hugh, the elder brothers of the last Lord of the Isles are described as illegitimate, but there is room to believe that they may have been the offspring of hand-fast marriages. The evidence on the subject is well recounted in an able work, MacDonald of the Isles, by A. M. W. Stirling, published by John Murray, 1913, Appendix I.�"It has been asserted both that Hugh was Alexander�s son by his wife Elizabeth Seton, and that his mother was a daughter of Gillepatrick Roy, a descendant of the O�Beolan Earls of Ross. So far as is known, the evidence in either case is not conclusive. Nevertheless, there is every reason to regard him as legitimate. In various charters, both Hugh of Sleat and Celestine of Lochalsh are designed by John, Earl of Ross and Lord of the Isles, simply as" frater," without any qualifying word, e.g., the charter confirmed by James IV. in 1495 is granted to �Carissimo fratri nostro Hugoni Alexandri de Insulis Domino de Slete,� and one of the witnesses is �Celestino de Insulis de Lochalch fratre nostro� (Reg. Mag. Sig., Vol. xiii., No. 186). A contrary opinion was at one time expressed in consequence of Hugh and Celestine being designed by John, Earl of Ross and Lord of the Isles, in a charter granted in 1470, as �fratribus carnalibus.� But a fuller knowledge of ancient writs has rendered any such inference of little or no value. Carnalis, it is now well known, is frequently applied to persons whose legitimacy is not open to question. A curious instance of the application of this word even to a brother uterine may be noted. From these facts the reader can judge for himself of the justice of the claims made by the heads of the three houses, of the Isles, Glengarry, and Clanranald, to be supreme chief of the MacDonalds. By way of evidence that their house was regarded as the head of the great MacDonald race, the Glengarry family cite many facts. Among these is the circumstance that in 1587, when the Scottish Parliament passed an Act for the keeping of the peace in the Highlands, MacDonald of Glengarry and Knoidart was made responsible for the peaceable behaviour of those of his name. For a time Glengarry was regarded as the deer forest belonging to the royal castle of Inverlochy, and the MacDonalds held as royal tenants, but they afterwards obtained a crown charter. In the year of Flodden they took part with MacDonald of Lochalsh in an attack on the royal castle of Urquhart, on Loch Ness. This connection led to one of the fiercest of the Highland feuds. Alexander MacDonald, sixth Chief of Glengarry, married Margaret, daughter of Sir Donald of Lochalsh, and when the latter died in 1519 he left half of his estate, Lochalsh, Loch Carron, and Attadale, with Strome Castle, to the pair. The other half was purchased by Mackenzie of Kintail. Soon the two were at each other�s throats. Mackenzie�s forester in Glen Affaric killed a Macdonald poacher. The MacDonalds in return murdered the brother of Fionnla Dubh of Gairloch. The Mackenzies next trapped Glengarry himself at Kishorn, slew his followers in cold blood, and seized his castle of Strome. His uncles also were murdered with all their people except two sons. Glengarry was released by the Privy Council, but the sons of his uncles grew up to waste Applecross with fire and sword, while Glengarry�s own son, Angus Og, harried Kintail, killed every man, woman, and child he could find, and drove a great spoil south to Glengarry. Mackenzie in return procured a commission of fire and sword, and with seventeen hundred men harried the MacDonald territory as far as Moray, and drove away the greatest spoil ever seen in the Highlands. Angus Og retaliated by ravaging Glenshiel and Letterfearn as far as Loch Duich, while his cousins again burned Applecross. During the raid one of them, forsaken by his followers, set his back to a rock and defended himself magnificently till a Mackenzie, climbing the rock, hurled a boulder on his head. The feud came to an end with two of the most famous incidents in Highland history. In November, 1602, Angus Og with seventeen birlinns set out to harry Loch Carron. As he returned, in passing through Kyle Akin he was attacked by a Mackenzie galley sent out from Eileandonan by the heroic Lady of Kintail, his birlinn struck a rock and capsized, and all his sixty warriors, with Angus Dubh himself, were slain. The final event took place in the following year, when the MacDonalds invaded Easter Ross, burned the church of Kilchrist with a party of Mackenzies inside, while their pipers marched round the blazing pile playing the tune which became the pibroch of the clan. But the lands of Loch Carron and Lochalsh were lost to Glengarry. AEneas the ninth Chief was out with Montrose in 1645 and for his pains had his new house of Invergarry burned by General Monk; but was afterwards compensated by Charles II. who made him Lord MacDonell and Aros. A notable figure in the campaign was Ian Lom, the famous bard of the house of Keppoch. At the battle of Inverlochy, in which the forces of Argyll were utterly defeated and cut to pieces by the Royalist clansmen under Montrose, Ian Lom placed himself on the battlements of the old castle to stimulate the royalist clansmen and witness the incidents which he was afterwards to weave into stirring verse. After the death of Montrose he composed a lament in his honour. At the Restoration he became a sort of Highland poet laureate, and was pensioned by Government. He lived to be present at the battle of Killiecrankie in 1689, and to celebrate the triumph of the Highlanders in his poem, "Rinrory." But perhaps the most striking episode in his career was that which brought him into direct touch with the Glengarry Chief. The incident has already been recounted in the article on the MacDonalds of Keppoch. In 1672, as Chief of the MacDonalds, Lord MacDonell and Aros was ordained to find caution for the good behaviour of "the whole name and clan." He died without issue in 1682, and the title accordingly became extinct. At a later day, "James VIII.," the Old Chevalier, granted a warrant for the restoration of the peerage, but as he never became king de facto, this did not take effect. Only, since the date of the peerage the family has adopted MacDonell as the spelling of its name. Lord MacDonell and Aros was succeeded as chief by his cousin, Ranald of Scotas. At the revolution in 1689, as befitted the tradition of his family, the next chief, Alastair Dubh MacRanald, took the side of the Stewarts, and commanded the clan at Killiecrankie. Lord Macaulay in his History describes how, "at the head of one large battalion towered the stately form of Glengarry, who bore in his hand the Royal Standard of James VII," Later he was seen mowing down two men at every stroke of his broad sword. On that occasion the Chief�s brother, Donald Gorm, performed heroic deeds, and, when attacked by an overwhelming number of the red-coated soldiers, he continued to catch their pikeheads in his target, and hew off the poles, till at last he fell, when no fewer than twelve pikeheads were found fixed in his buckler. Glengarry himself afterwards reluctantly took the oath of allegiance to William III. in 1691, and when that monarch and his successor, Queen Anne, had passed away, the chief might have continued in allegiance to George I. As a matter of fact, his name appeared first among the signatures to the loyal address of the Highland chiefs, which was presented by the Earl of Mar to the new king when he landed at Greenwich in 1714. But King George slighted the document, and turned his back on the Earl. The latter, thereupon, scenting danger to himself, fled disguised in a coaling vessel to the north, and called the great meeting of the chiefs which became known as the "Hunting of Mar." At the meeting at Braemar, Glengarry attended to ascertain the Earl�s plans, and let him know what the Highlanders were prepared to do for King James. At that time the clan could furnish 800 fighting men, and Glengarry led them throughout the campaign and fought at Sheriffmuir. For this he had his house burned down, and was so reduced that he had to let his woods to an English company for iron smelting. He was afterwards, in 1720, appointed a trustee for managing the Chevalier�s affairs in Scotland, and he died in 1724. At the time of Prince Charles Edward�s landing in 1745 the head of the clan was one of the most ardent supporters of the Stewart cause. It was at Invergarry that Prince Charles lay and gathered his forces on the night before setting out to encounter General Cope at Corryarrack, and it was here, as we have seen, that on the night after Culloden the Prince enjoyed his first substantial meal, and for the political opinions and active services of the chief, the house was presently given to the flames. At Falkirk Angus MacDonald, the Chief�s second son, who led his clansmen, was killed by the accidental discharge of a musket, and the incident is said to have so discouraged the clansmen that they did not regain their native spirit. At Culloden, as already mentioned, the MacDonalds were not appointed to their usual place of honour on the right, and in consequence stood sullenly aloof when the Highland army was ordered to charge. Their leader, MacDonald of Keppoch, advancing alone, fell with the bitter words on his lips, "Have the children of my tribe forsaken me?" and MacDonell of Scotas, who was reckoned the bravest man of the clan in the Prince�s army, and had fifty men under his command, fell with his lieutenant, ensign, sergeant, corporal, and eighteen privates. A very different personage was his elder son, Alastair Ruadh, who was to succeed as thirteenth Chief of Glengarry nine years later. This is the individual who remained known to posterity by the unenviable name of "Pickle, the Spy." Like Murray of Broughton, who was the Prince�s secretary, he lies under the suspicion of having played a double part from first to last. In 1738, when he was perhaps thirteen years of age, the estates being heavily burdened and the free income only �330 sterling, he went to France, and in 1743 he joined Lord Drummond�s regiment of Royal Scots Guards in the French service. Before the landing of Prince Charles Edward in Scotland in 1745, he was employed by the Highland chiefs on a secret mission to the Prince. He was, however, captured by the English, and imprisoned in the Tower of London from 1745 till 1747. Finally, from 1749 till 1754, when he succeeded as Chief of the Clan, he acted, under the pseudonym of "Pickle," as a spy on the Prince. The whole history of his exploits was in recent years brought to light in a volume by the late Andrew Lang, under the title of "Pickle, the Spy." Alastair Ruadh was one of the most polished men of his time, in outward appearance one of the most chivalrous, and in reality perhaps the most unscrupulous. He was probably the original of Stevenson�s " Master of Ballantrae." At the time of the latest Jacobite rebellion the clan was reckoned to be 700 strong. Duncan, the next chief, restored the family fortunes by marrying an heiress and introducing sheep-farming on his estates, but his policy led to the emigration of large numbers of his clansmen. From �700 per annum in 1761 his rental rose to �5,000 before the end of the century. Not the least notable of the long line of Glengarry chiefs was his son, the last who retained a footing in the Highlands, Alexander Ranaldson MacDonell. A colonel, and major of the Glengarry Fencibles, he was an enthusiastic upholder of the old Highland games, and gave prizes yearly to the winners at the great sports at Inverness and Fort William. He set much store upon keeping up the historic memories and feudal splendours of his house. It was he who set up the monument at the Well of the Heads in 1812, his own name being inserted upon it as "Colonel M�Donell of Glengarry, XVII. Mac-mhic-Alaister." 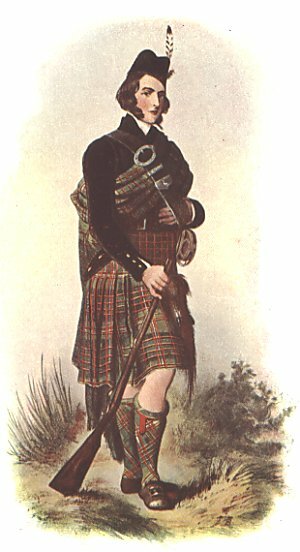 When Gustavus, eldest son of the King of Sweden, deposed in 1809, during his education in Edinburgh, made an excursion to the district, "Glengarry awaited the Prince�s arrival at the boundary of his property with a numerous following in full Highland garb, with bagpipes, broadswords, and targets, and a barrel of whisky." Likewise, when George IV. paid his visit to Edinburgh in 1822, Glengarry took a body of his clansmen to the city, where they excited the wonder and admiration of the people. In his youth he had killed in a duel a young officer who at a county ball was a rival for the hand of Miss Forbes of Culloden, and later in life he picked a quarrel with a doctor at Fort Augustus who in consequence was severely mauled by his henchman. For this he was fined �2,000. The Chief made a point of maintaining the dress and style of living of his ancestors. He travelled with the Luchd-crios, or body-guard, and when he took up his quarters at any house these were posted as sentinels with military regularity. His death, alas! was tragic. The steamer Stirling Castle, in which he was a passenger on a day in 1828, having run ashore opposite Fort William in Loch Linnhe, the Chief with rash impetuosity leaped overboard, and was killed instantly on a rock. His brother, Sir James MacDonell, who died in 1857, was a distinguished soldier in the Napoleonic Wars. After fighting in Naples, Sicily, and Egypt, he took part at the Peninsula, and was engaged at Waterloo. He afterwards commanded in Canada for three years, became a general in 1854, and G.C.B. in 1855. The lavishness of the seventeenth chief, Alexander Ranaldson, however, left his son and successor in serious difficulties, and, in 1828, the estate was sold to the Marquess of Huntly, from whom it passed successively to the Earl of Dudley and to Honourable Edward Ellice. The Knoydart portion was sold in 1853 to James Baird of Cambusdom. Meanwhile, as already mentioned, the Chief transferred himself with a large body of his clan to Upper Canada. For this enterprise the way had been prepared by a very notable personage and member of the tribe, Alexander MacDonell, first Roman Catholic Bishop of Upper Canada. Educated at the Scots College at Valladolid, and ordained in 1777, this individual, while a mission priest in his native district, helped to embody the clansmen into the first Glengarry Fencibles, and when the regiment was disbanded in 1801 he obtained for the men a grant of land in Canada. There he again raised a regiment of Glengarry Fencibles, which was of much service in Upper Canada during the war with the United States in 1812. He himself organised the colony, and carried on valuable missionary work there, being made Vicar Apostolic of Upper Canada in 1819, and Bishop of Regiopolis or Kingston in 1826. He lived to see the young Chief come over with the body of his clan, and at his death in 1840 was buried in his own Cathedral at Kingston. The British public has of late been reminded of the existence of this colony of pure-blooded Scottish Highlanders in Canada by the appearance of a series of stories of Canadian life, of which the first and principal was "The Man from Glengarry." During the great war of 1914 not a few of the Canadian Highlanders, who so magnificently played their part in the conflict, paid a visit to the ancient stronghold of the MacDonells on Loch Oich, to view for themselves the scene amid which the chiefs who prided themselves in the name of Mac-Mhic-Alaister lived in feudal state, and to stand on the rocky headland of Creagan Nam Fitheach, whose name was the slogan of the clan. With the death of Charles Ranaldson MacDonell, the eighteenth Chief, in 1868, the line of the notorious Alastair Ruadh (Pickle the Spy) came to an end. The successor to the chiefship was AEneas Ranald MacDonell of Scotas, descendant of the brave MacDonell of Scotas who fell at Culloden, and himself great-grandfather of the present Chief, British Vice-Consul at Baku in Russia. Septs of Clan MacDonell of Glengary: Alexander, Sanderson.